WIGAN householders have been reassured that their tap water is safe to drink as neighbouring towns suffer a contamination scare. But it is a near thing as a United Utilities map shows that supplies in communities right up to the borough border in several places are being warned to keep boiling their water after discovery of a stomach bug at a Preston processing plant. 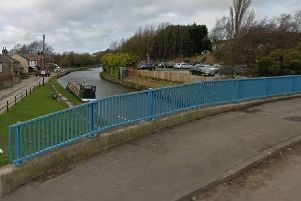 Cryptosporidium can cause vomiting and diarrhoea and its presence was found in routine samples taken at the Franklaw Water Treatment Plant near Garstang on Thursday. United Utilities says it is making significant progress in eliminating traces of the bug cryptosporidion in supplies and the problem should be solved by this Thursday at the latest. One clear sample has now been tested, but scientists want to see a series of similar results before they can lift the alert across areas of the county including Preston, South Ribble, Chorley, the Fylde Coast and parts of Blackburn. But in the meantime around 300,000 residents in various parts of Lancashire are being told to keep boiling their drinking water. Sales of bottled water have rocketed in the region since the alarm was raised and a number of smaller businesses, especially cafes, have been forced to close because they say that boiling then chilling large amounts of water is logistically impossible. But UU scientists say that once water has been boiled, it is perfectly safe to drink and, as such, there is no need to spend money on spring water from shops. “We are hoping to get some positive updates in the next couple of days,” said a company spokesperson on Monday. “We are getting some results that contain much, much lower levels and others that are clear.